The most amazing and uniquely formulated product in the horse industry today! Premier Rose’ Conditioner is a leave-in skin and hair conditioner. Developed for the entire body, mane and tail. Premier Rose’ Conditioner provides a moisture lock to ensure the most beautiful hair coat attainable, yet it takes just minutes a day. Premier Rose’ Conditioner eliminates dry skin and creates elasticity within the hair shaft reducing breakage. We have documented, three to five inches of tail growth within six months. 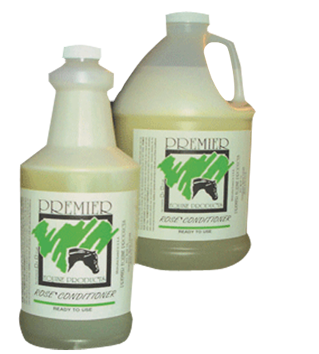 Premier Equine Products are designed for performance, halter and draft horses. Absolutely NO silicon! Premier Rose’ Conditioner will never cause slippage of tack or harness. By providing an incredible moisture level, Premier Rose’ Conditioner, allows the skin and hair to loose the static electricity that can attract dust and dirt. Premier Rose’ Conditioner ensures moisture levels that reduce the ability to soak up and set in stains. The hair generally deepens in color, two to three shades. How to Use It: Spray Premier Rose’ Conditioner over the entire body, mane and tail, they can be wet or dry. Brush in. For just pennies per day and in three to five minutes, you can attain the optimum healthy skin and hair you and your horse have always wanted.